Leslieville is a central Toronto neighbourhood in Toronto. 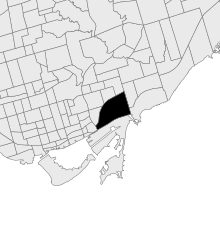 Leslieville largely features semi-detached houses, accounting for 38% of sales, followed by condos at 27% and detached houses at 17%. 2-storey houses are the most common style and the majority of properties have 3 bedrooms. Interested in new home listings in Leslieville?